fixed speed cameras, mobile speed cameras, radars and radar traffic light ... stretch. Although not actually correct to call it radar, this kind of 'cazamultas' of DGT (DGT) are becoming more common on Spanish roads. Unlike other radars, the latter are the average speed between two controlled points in the same section to determine which car has committed an offense. But how do they work? 1. The vehicle enters a controlled speed stretch: An infrared camera machine vision on each lane, with system character recognition (OCR), captures the moment when we pass under the 'portico No. 1', reading tuition. a recording in which is recorded the day, hour, minute and second by which the car has passed under the porch is performed. The picture quality is up to 1280x1024 pixels. 2. The vehicle leaves the section: A twin system records data over vehicle output section guarded 'gantry # 2'. 3. Data transfer and calculation: With the data recorded by the cameras, software checks the time that each vehicle has been slow to cross the tunnel and calculating its average speed. If this is higher than allowed or what is the same, it takes less time established-at least the data refer fiber optic Center Automated Denunciations of DGT in Leon. There the corresponding file is processed and the complaint refers to holder fined vehicle. 0.1 Example: In the radar section located in the Guadarrama tunnel, linking Madrid and Castilla y Leon, a stretch with 3,323 km length is controlled. A limited speed of 100 km / h, any vehicle to do it in less than 2 minutes and 5 seconds will be fined. 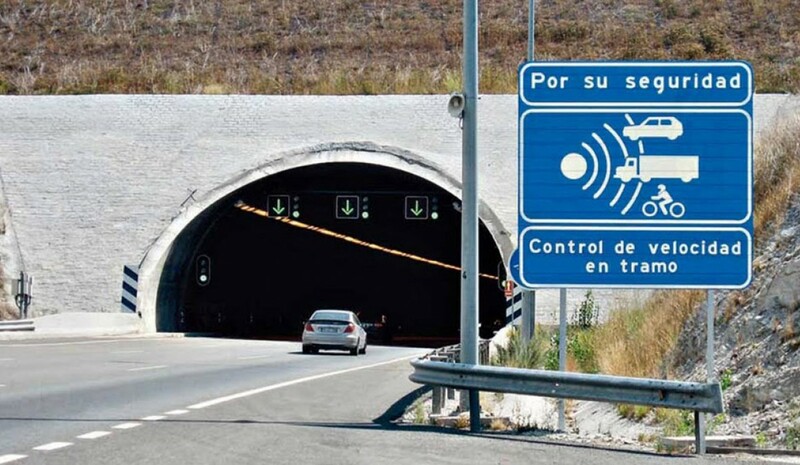 Example: In the radar section located in the Guadarrama tunnel, linking Madrid and Castilla y Leon, a stretch with 3,323 km length is controlled. A limited speed of 100 km / h, any vehicle to do it in less than 2 minutes and 5 seconds will be fined. - Radars are interconnected. Thus, if we enter controlled by the right wing and the left leg out, reading tuition will also take place and may be fined either. - It is also infringement, mild in this case, Circular below 50 percent of the set speed, so we may fine too. - Cameras infrared reading They can work equally at night or in low light conditions, the flash being unnecessary. - Unlike conventional radar, these They have no margin for error, so they are much more reliable. - However, like conventional radar, the stretch They are marked with the same signal, with the only change that point 'Speed ​​control section'. - These radars section They have to meet a series conditions: changes have no speed limits, no inputs or outputs during the kilometers stretch control. سكودا رابيد وSpaceback 2017: حاولنا! Domande: Quanta acqua è quello di portare il serbatoio lavavetri?